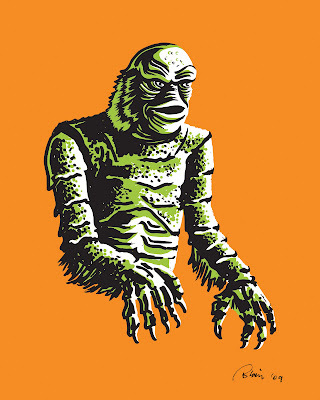 On the heels of the monster illustration I did earlier in the month for In This Week magazine, I just had to do a portrait of my favorite Universal Monster, The Gilman from "The Creature From The Black Lagoon." Using my Creature figure as a model, I drew him in ink and colored him digitally. You can watch video of me sketching and inking the black of the Gilman on my channel at Draw Dammit. Just click on menu, and click on "movies". The "Creature Feature" will be under 10/19/09 5:34. Here's an illustration I did for my Friday Mix page in The Salt Lake Tribune. 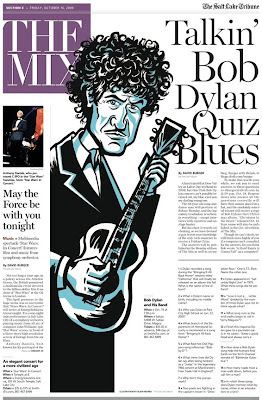 Bob Dylan will be in town for a concert, but since he wouldn't give an interview, we decided to have a quiz. And instead of the hand out art we've run a hundred times before, I decided to do an illustration. 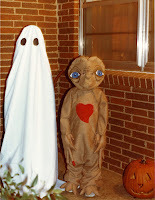 USA Today's Pop Candy blog is posting reader's old Halloween costume photos this month and the E.T. costume my mother made when I was four was today's pic. The quote I gave: Check it out here. 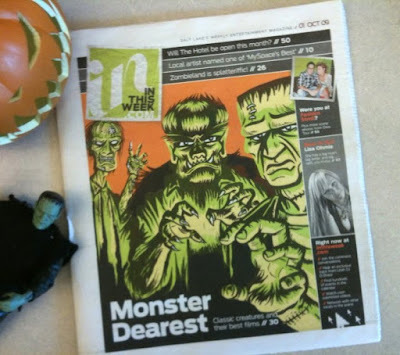 Almost forgot — here's the final cover of In This Week that came out last week with my illustrations in it.